U LOŠEM STANJU, PODERANE SU GUME, TREBA IH ZAMJENITI. OSTALO OK.
BICIKL DJEČIJI, U LOŠEM STANJU, PODERANE GUME. 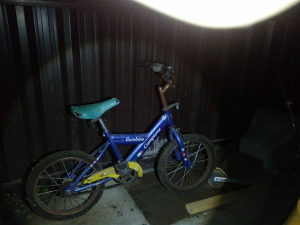 DJEČIJI BICIKL U DOSTA LOŠEM STANJU, GUME SU PODERANE, TREBALO BI IH ZAMJENITI. OSTALO OK, ZADNJA TORPEDO KOČNICA, FELUGE IMAJU SVE ŽICE.